I've never had Amaretti cookies but I've seen Giada use them plenty of times. I went to Safeway (first stop), Trader Joes, and then intended to go to AJ's or World Market, but didn't make it. So, I got ambitious and decided to make them myself, since my son was already asleep and a trip to the store wouldn't work. So, I started on the recipe and had the food processor purring when I realized I didn't have any almond extract. I subbed some Almond Flavored Syrup I use for Italian Sodas. Well, it didn't quite do it. The cookies came out cute but not quite as delicious as I imagined. I ground them up, made the torte, and scooped the batter into mini tart pans to bake. The batter tasted delicious and I set the timer for 20 minutes. When I came in, they were no where near streaky or anything like Dorie described! Unfortunately, too many subs and too much time in the oven ruined these. They were over cooked so I didn't bother to frost them. But, when I find those delicious cookies Dorie describes (and my almond extract... it's with my cake dec stuff somewhere in a box) I'll try again. Be sure to check everyone's beautiful Tortes from Tuesdays with Dorie and keep an eye out for those cookies! Check back later for my Easter Dessert... Lemon Curd Cheesecake without a water bath or any drama- just deliciousness! Awww... too bad you overcooked the tortes, they were actually quite good! I think it's great you made it..unlike me.. haha. The tart pans make the cake look cute! What a great idea to make them in tart pans! Too bad they didn't work out. I had to sit this one out but I hope to make it later in the month. Bummer, sorry it didn't work out! Mine was a bit overcooked too I think. 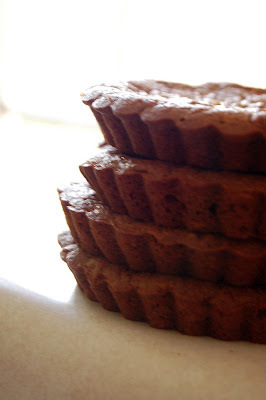 They do look really cute though - great idea to make them in tart pans. Interestingly enough, many Starbucks are currently selling Amaretti cookies- kind of random, but maybe it's a currently promotion? Italian espresso, Italian cookies? So you could keep your eyes open for them there. Ugg, overcooked? SIGH. They sure DO look SO pretty though!!! Bravo for trying! Easy to overcook cake. 'specially chocolate. Love the little stack tho. Bummer that this didn't work out for you this week. That was ambitious to bake your own ameratti cookies though! Hopefully it will turn out better next time. Even your overcooked desserts look pretty, Anne. Sorry these didn't work out - next time! Looking forward to reading about your lemon curd cheesecake! The tart pans are adorable. And I can't believe you made your own cookies. I'm always amazed at that kind of stuff. I liked this torte. Cute stack of minis; sorry they didn't work out for you. Oh too bad. You'll have to try this one again because it was definitely worth it. Sorry it didn't work out, you gotta try this one again sometime. It's yummy! I might have to make the cookies myself too. I couldn't find amaretti cookies either. The closest Italian market is like 20 miles away.. The results may have been a bummer but kudos for trying to make homemade cookies. Too bad it didn't work out for you. At least you made your own cookies. Lemon curd cheesecake. YUM. Your tarts look cute. Sorry they didn't turn out. I hope you get a chance to try again but thanks for giving it such an awesome effort! They still look really cute with their ruffled edges! Personally, I don't think you missed out on this one, but the cookies by themselves are really good! I made my cookies also, using a biscotti recipe. I would like to try it though with the cookies Dorie used. Some weeks are just like this, aren't they? It is most comforting to know that one is not alone when something goes awry...sometimes I think I am the ONLY one not getting it...LOL...and then someone with a gracious nature steps up and says, "Hey, I didn't do so hot this week...." and I figure I will keep trying! They look lovely all stacked up, I will say! And, those cookies are addicting! I will be sure to check back. Hey, we always learn from our attempts. I think it is very admirable that you gave it a go and tried to be resourceful. That is how we grow. Sorry they didn't turn out, but they are very cute!